'Use a tight tape measure for an accurate fit, don't rely on your trouser size'. Our most popular hernia brief. For men who require a Inguinal Hernia support in a Boxer brief cut. Suitable for single or double inguinal hernia. ef. If you are used to existing boxer shorts with material that comes onto the leg rather than the thigh you may prefer this style. One of our most popular hernia briefs, these have slightly more cotton content than the #316 so useful in the summer or for travel. Features a front-opening flap. If you have a large stomach consider the #560 or #313 for a better fit. Suitable for single or double inguinal hernia. For those men who like or need a high support. This is our mainstream choice and also available on NHS prescription for UK customers because of the large size range. Less suitable if you have a large stomach because the high waist size measurement is distorted and customers tend to pick a bigger brief than they need . Front-opening 'drawbridge' flap for comfort. Suitable for single or double inguinal hernia. Additionally, customers with existing back problems have also reported pain relief for the back when wearing these briefs. A very conventional-looking brief and designed for men who are active or conscious of their condition in a public setting. No front opening. Designed for a relatively small hernia (peanut size). Suitable if you have a relatively large stomach as the width measurement starts lower down. Suitable for single or double inguinal hernia. For men who require a low-cut more conventional looking inguinal hernia brief. Side-opening. Also suitable if you have a relatively large stomach as the width measurement starts lower down. Suitable for single or double inguinal hernia. 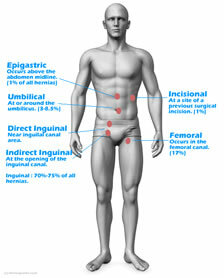 The low-waisted version of our #316 Inguinal Hernia brief.